AZ series was introduced since 2000 – to gradually supplant the legendary S series, and for ten years remained the main mid-size engine of company. Installed in many initially FF C/D/E-class cars, vans, light- and medium-SUVs. 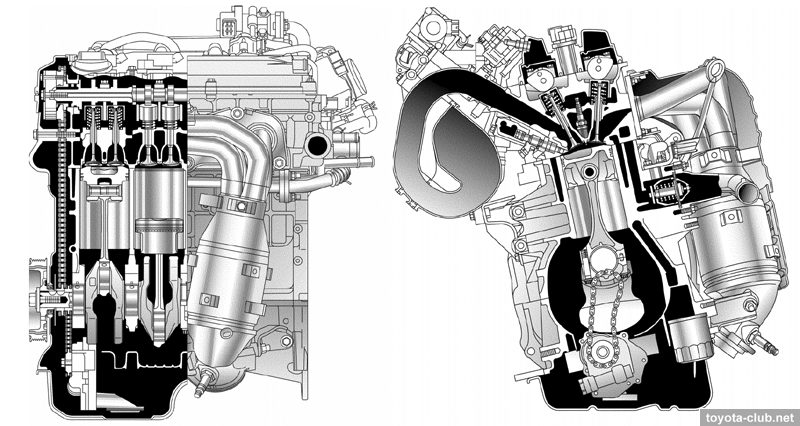 1AZ-FE engine can be seen as a simplified version of 2AZ-FE. There is no balancing mechanism. No oil nozzles in the block. – For some regions specific modifications was produced – for leaded gasoline, without VVT, without converter and relative components. 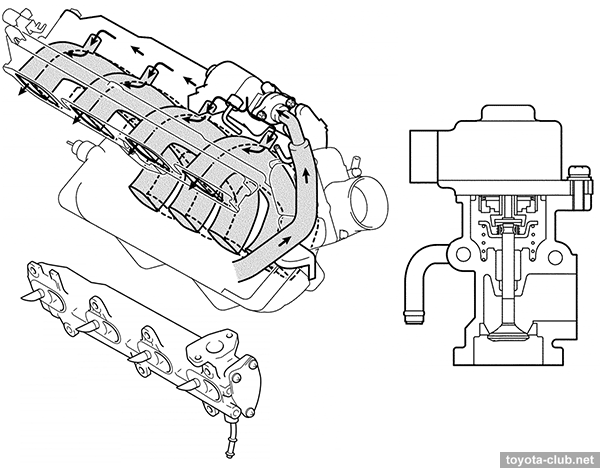 1AZ-FSE, 2AZ-FSE – transverse, with direct injection, for initially FF cars, vans and SUVs. Installed in: Allion/Premio 240, Avensis 220..250, Caldina 240, Gaia, Isis, Nadia, Noah/Voxy 60, Opa, RAV4 20, Vista 50, Wish 10. 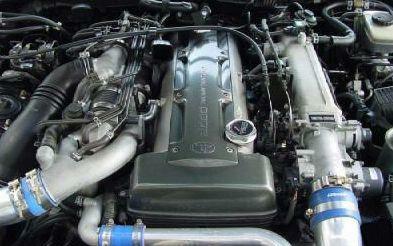 By 2009 replaced by ZR engines with traditional multipoint injection (and Valvematic system). There are some differences in the mechanical part of D-4 engines. The higher the compression ratio. 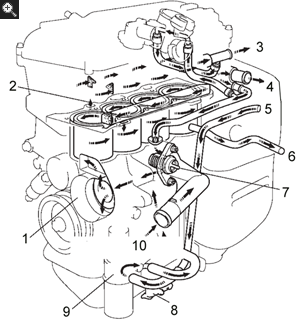 The fuel injectors are mounted in cylinder head. 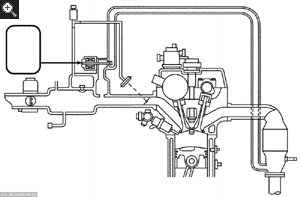 High pressure fuel pump is driven by additional cam on the inlet camshaft. Variable valve timing range 43°. 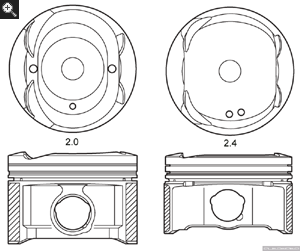 – The pistons has the specify shape which help to lead the fuel spray to the area of the spark plug. The top ring groove has anti-wear alumite coating. – Some models was equipped with oil cooler. 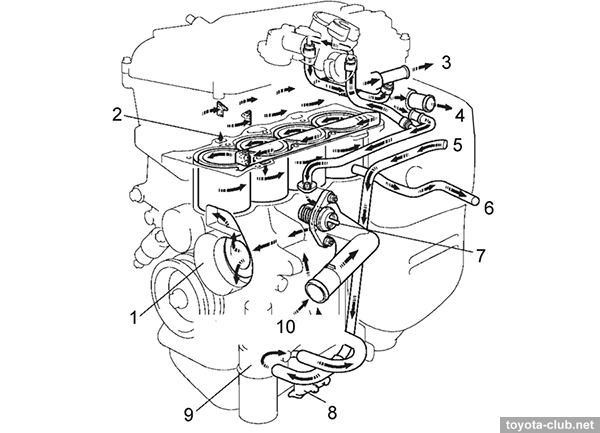 1 – water pump, 2 – bypass, 3 – to heater, 4 – to radiator, 5 – from ATF heater, 6 – to ATF heater, 7 – thermostat, 8 – drain, 9 – oil cooler, 10 – from radiator. 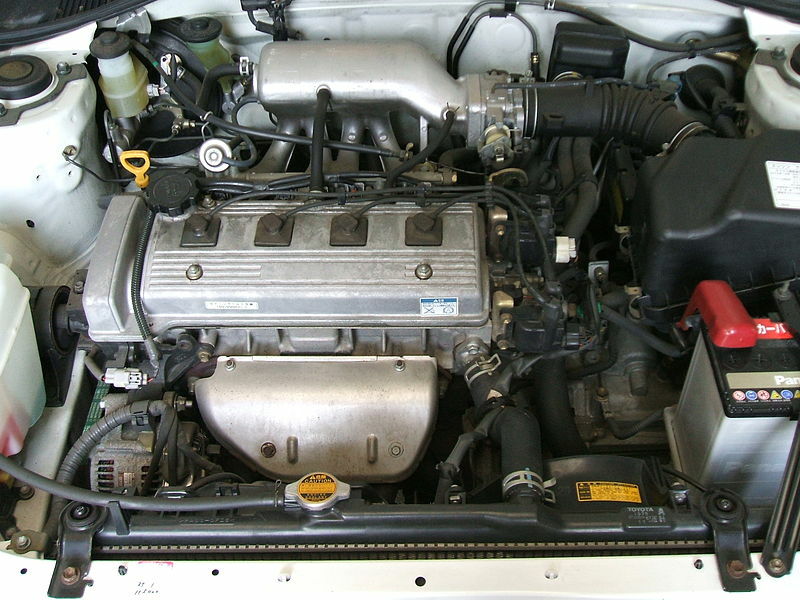 – Differences of version for Japanese domestic market (type’2004): a compression ratio 10.5 instead of 9.8, three-layer cylinder head gasket instead of a two-layer, other shape of the combustion chamber, additional channels for coolant between the cylinders, the other valve timing, intake valve lift 9.4 instead of 8.2 mm, exhaust – 8.0 instead of 8.6 mm, reduced by 1.1 mm piston height. Driven by motor with control unit commands. 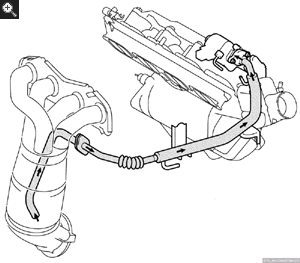 When starting the throttle is slightly opened to allow additional air intake, and then the opening angle decreases depending on the coolant temperature. At the homogeneous mode idling speed is adjusted by throttle moving, at LeanBurn mode – by fuel supply volume correction with constant throttle opening. In addition, ETCS performs traction control (TRC) function and some stabilization system (VSC) functions. SCV (swirl control valve) actuator. 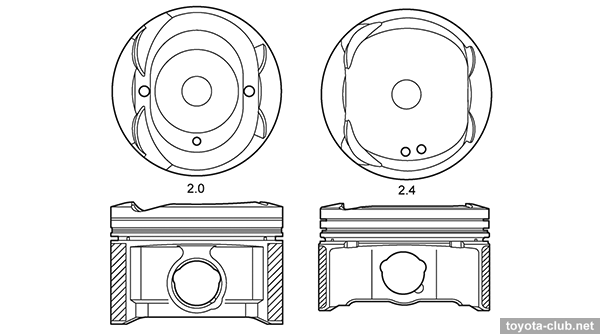 There is SCV block between the cylinder head and the inlet manifold, which closes one of two inlets channel to each cylinder, depending on the driving conditions. The flaps are driven by vacuum actuator. 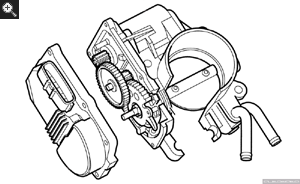 1 – SCV actuator, 2 – SCV valve, 3 – MAP sensor. – At low speed, low load, low coolant temperature SCV is closed, air flows through one port, that increases flow speed and forms a vortex in the cylinder, for better mixture turbulization. – At high load, SCV opens and air flows through the both ports. Considering the air supply system features, additional pressure sensor for the brake servo was implemented, to switch the mode that provides the specified vacuum level. 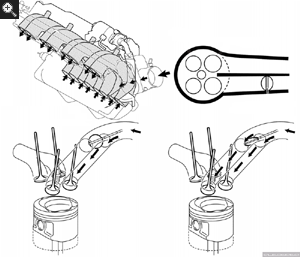 Exhaust gas recirculation system of D-4 engines provides inlet of significant proportion of the exhaust gas at LeanBurn mode (much more than in traditional engines). It allows to low combustion temperature, decrease content of nitrogen oxides in the exhaust gases, reduce pumping losses at the inlet. EGR valve is driven by DC step-motor, opening angle depends on the engine speed, coolant temperature, load and vehicle speed. 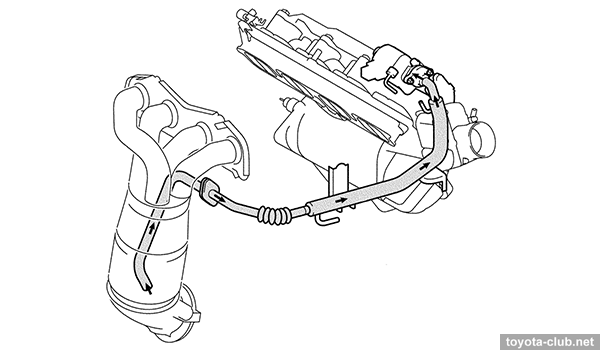 Exhaust gases from the valve flows into EGR aluminum manifold, which uniforms stream of gases in each cylinder. Both the valve and manifold are water cooled. In the exhaust pipe of Japanese models NOx converter is installed. LeanBurn mode is accompanied by an increased emission of NOx, than the nitric oxide reacts with oxygen of the exhaust gas (O2), and products are accumulated on the catalyst adsorbing material in the form of nitrates (NO2). At homogeneous mode, with sufficiently rich mixture, the content of CO and HC in the exhaust gases increases, with its involvement in the presence of platinum dioxide (NO2) is reduced to nitrogen (N2). Simultaneously with the accumulation of nitrogen oxides converter actively captures the sulphur, which takes the useful volume of the absorbent layer, so the system can to function normally only using low-sulphur gasoline. 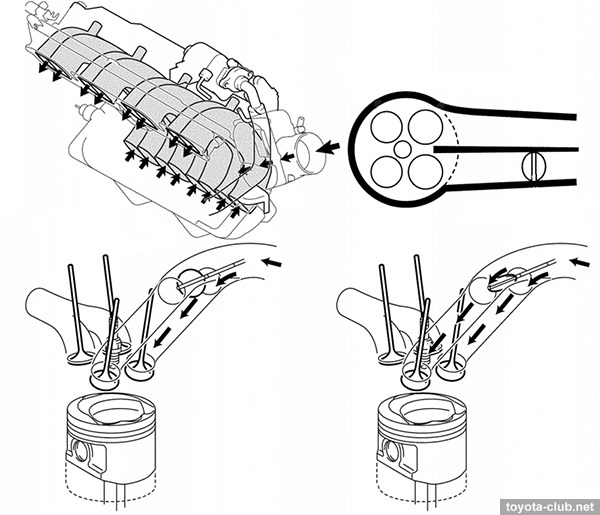 Ignition system – DIS-4, spark plugs with iridium centre electrode (initially for overseas market – Denso SK20R11 / NGK IFR6A11, since MY2003 – Denso SK20BR11 with two additional side electrodes, for domestic market – SK20BGR11 – protruded in the combustion chamber due to long shroud). Type’2004 differences: L-type control system with MAF sensor, ETCS actuator with throttle position sensor (Hall effect), absence of separate NO-converter. • The above mentioned typical defects of 2AZ-FE engines are relevant for -FSE engines, including the problem with the “drop head” failure (defective parts – 11400-28120, -28160, ~$5000-6000). The tendency to noticeable vibrations due to low nominal idle speed, drawdown further with minimum deviations of engine management system components operation. Sometimes the traction loss at medium speed occurs and driving performance is deteriorated. Often, the cause can not be found even by whole units replacement, although in some cases, cleaning of MAF sensor, throttle, SCV actuator, or replacement of VVT valve, ignition coil terminals, EGR forced clogging may be useful. 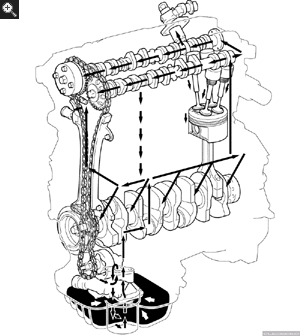 To partially smooth discomfort from rpm subsidence helps replacement of the engine mounts (primarily – liquid filled). Direct injection and control system have no such critical defects as first generation (3S-FSE), and require less attention. 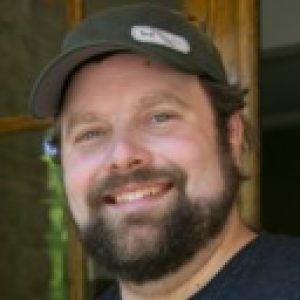 Recommended to be extremely careful with brittle plastic parts of the injectors (~$300), sometime injectors required in case of coil deteriorating. Replacement of low-pressure electric pump and fuel tank filter often requires. 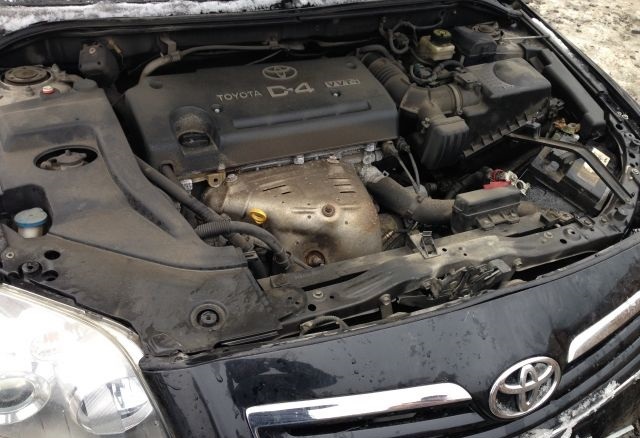 Note formal recall campaigns concerning fuel pipe replacement and the fuel pump check valve for the Avensis 250. 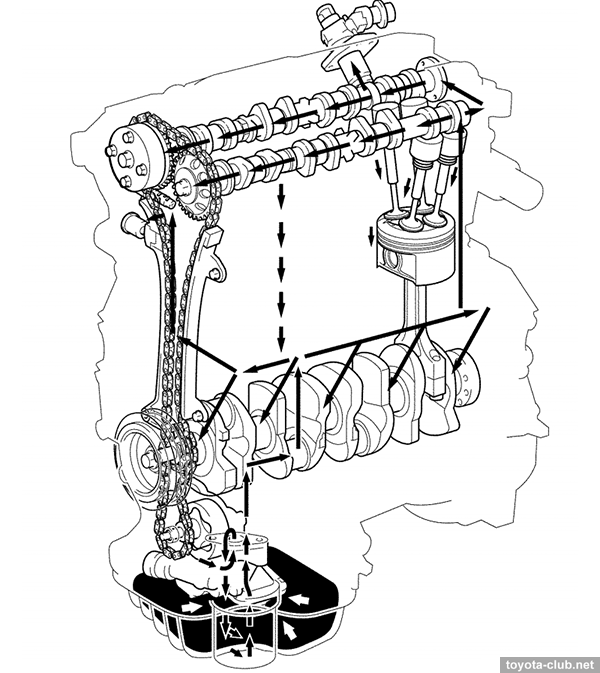 EGR operation traditionally causes a strong carbon deposits in the inlet – from the throttle to the SCV and valves, and therefore requires regular mechanical and chemical treatment. Otherwise, problems of rpm drawdown and cold start are inevitable. There is not EGR at -FSE engines for domestic market, but it does not eliminate the need for cleaning the intake of the oil sludge. After more than ten years since the first AZ appearance we can evaluate the series as a whole. Specs. Power output and torque – are consistent with the average level of asian analogs, and in most cases provides enough thrust-weight ratio (except perhaps medium-SUVs). Direct injection. D-4 did not cause significant performance gain or improvement in fuel efficiency compare to conventional motors of AZ series, and performs primarily “environmental” objectives. But increased cost of maintenance and repair of the “excess” components is enough to once again make sure of worthlessness and harm of using direct injection engines on the low-forced natural aspirated engines. Although 1..2AZ-FSE are more reliable than a terrible 3S-FSE, ordinary 1..2AZ-FE with multipoint injection are less of a problem. Not to mention that because of an incurable idling low rpm problem (with the attendant vibrations) such cars driving is uncomfortable. Small note – in 2008 the known asian auto-repairer wrote: “but the progress is not standing still, and MFI soon be will be replaced by DI”, but in reality the D-4 history has developed somewhat differently. Repairability. 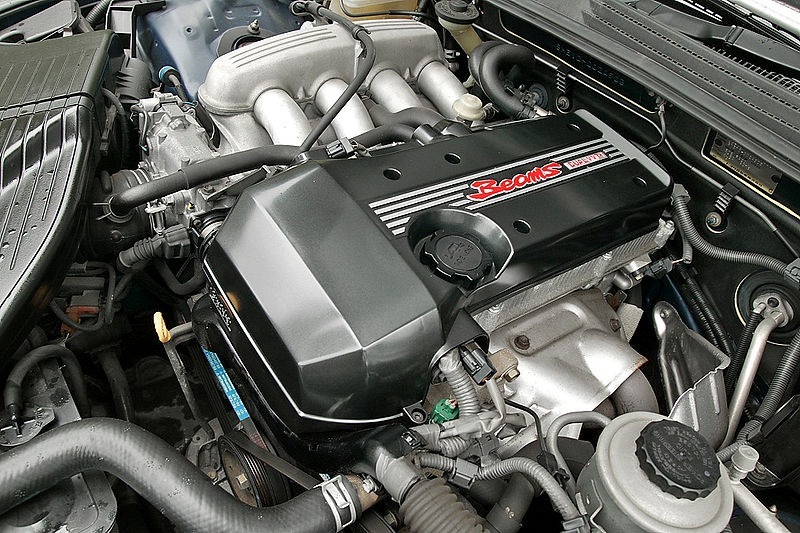 From the point of view of the manufacturer AZ considered “disposable”, as well as all the modern engines without “oversize” concept. Of course, in despair, these engines are subjected to overhaul, with cylinder block liners replacement using non-original parts or matched counterparts from other brands. The minimum cost of such work, as usual, is comparable to the price of the used engine – $1500-2000, whereas in the top-workshops complete overhaul valued at $4000-5000. As with other aspects of maintainability, here things are good – 2AZ-FE and 1AZ-FSE and shipped both to the European and the domestic markets, which has removed a lot of problems with spare parts and “second hand” engines. Reliability. 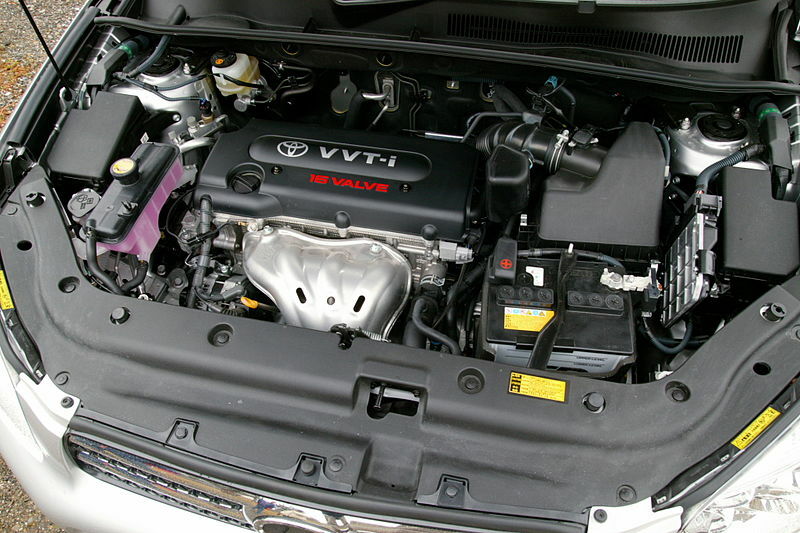 In the aggregate of most specs AZ series could be considered not bad representatives of the “3rd wave” motors, but only one critical defect of the cylinder heads ever eliminated their reputation, becoming a congenital malformation of popular models (Camry 30, RAV4 20, Highlander 20…), and undermined confidence to even later modifications.